Copper-colored ceramic-coated cookware is relatively new, heavily advertised and looks like an amazing addition to any kitchen. There are several competitors in this space, including Gotham Steel and Copper Chef. So which is better? In this review, I compared the two companies using two different choices - the 10-piece sets that each has on the market, and a direct comparison of their square frying pans. Which Is The Better Buy? Gotham or Copper Chef? Final Thoughts - Which Is The Best? Gotham Steel claims to be the first product in this class of cookware. It uses high-grade titanium and ceramic for its surface finishing. This ensures a nonstick surface that claims to be superior to traditional Teflon nonstick cookware. It also means the pans can go in the oven. 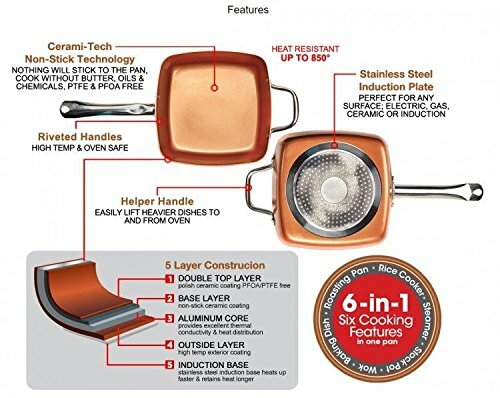 Copper Chef also has a non-stick coating called Cerami-Tech but combines that with a stainless steel induction plate in the bottom of the skillet. It claims that this allows the heat to distribute more evenly and effectively and therefore allows you to cook faster. It can also be used on the stovetop or in the oven. Gotham Steel claims to be the first product in its class to use high-grade titanium and ceramic as the surface finishing on its cookware. This makes the pots and pans durable but also multi-functional because they can be used on the stovetop or in the oven, and then thrown in the dishwasher. They can even go in the microwave. The high heat threshold of the pans allows for searing without sticking. The “ti-cerama” (titanium and ceramic) coating makes them non-stick and easy to clean. They are also rust proof and come with the promise that the coating will not peel off, even with constant usage and washing. If you're concerned, see our ceramic cookware dangers guide. There is no concern about hazardous chemicals infiltrating the food because the implements are PTFE/ PFOS/ PFOA free. These three chemicals can be present in non-stick cookware and have raised health concerns recently as being toxic. There is no need to add oil or butter when cooking, making food lower in fat content. 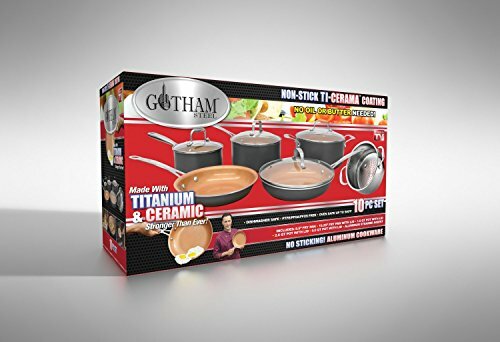 The Gotham Steel 10-piece set includes three pots, two frying pans, a steamer insert and four lids. 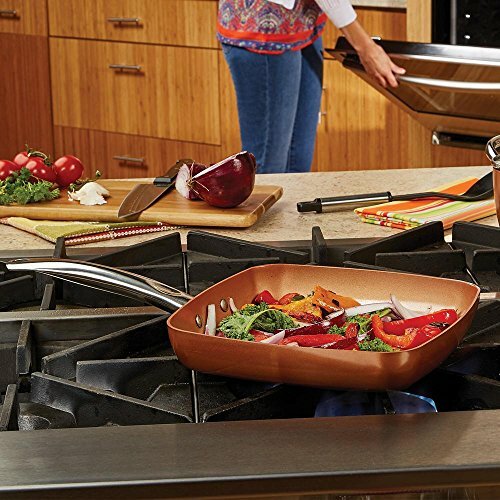 Copper Chef’s cookware features what it calls Cerami-Tech coating. The copper-colored finish doesn’t require oil or butter to cook. It can be used on any cooking surface: gas, electric, glass, ceramics, or the best induction cooktop. It can also go in the oven, and it is also dishwasher safe. It claims it can even be used when camping! The centerpiece of this set is a deep, square frying pan/pot that it claims will replace multiple kitchen items because it can serve as a wok, a baking dish, a roasting pan, a rice cooker, a steamer and a stock pot. The square shape provides a 25% larger cooking space when compared to a round pot. You can use it to fry, boil, steam, and bake. It has a long handle like you would find on a frying pan, and an extra handle on the other side, like the handle on a pot, to enable you to lift it easily. It is also health-conscious as it is also free of the chemicals PTFE and PFOA. 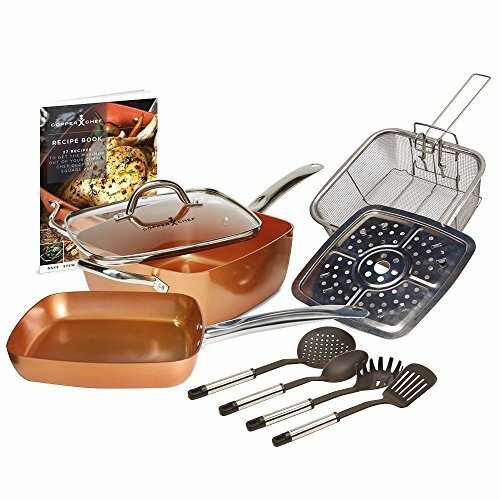 Along with the deep pan, the Copper Chef 10-piece set includes a 9.5-inch square frying pan (less than two inches deep vs. almost five inches), a tempered glass lid, a fry basket for deep-frying, a steamer rack, four utensils to use with the pans, and a recipe book. A component of your decision when looking at these two sets is the usage planned for them. They have very different pieces as part of the set, so it will depend on what you want. If you want to stock your kitchen with basic pots and pans, these will be ideal as they have variety in size for pots, with lids, as well as the steamer insert that will allow you to steam vegetables with the largest pot. The lids are tempered glass, create an airtight seal over the pot, and have stay-cool handles. You will also get two sizes of frying pans, one with a lid) and will be set up for what you need. If you want one pot that is multi-use, that can handle everything from deep-frying to baking to steaming the Copper Chef set may be for you. The coatings and quality of the products are a second piece of the puzzle. They both claim to be non-stick, long-wearing, superior cookware. The Gotham products are for use on the stovetop, and also compatible in the oven up to 500 degrees Fahrenheit. They are microwave safe, dishwasher safe, and can be used with metal utensils. They are not compatible with induction, however, so if you cook on an induction burner, they are not for you. The Copper Chef set can be used on any cooking surface, including induction, and is oven-safe to 850 degrees Fahrenheit. This means you can use the deep pot/pan for a multitude of uses, and you have the second frying pan as a smaller option, more like a traditional frying pan. If you want to cook at extremely high heat, and you want the versatility of one pot in your cupboard instead of many, the Copper Chef set is for you. Gotham Steel also makes a square frying pan with its “ti-cerama” coating. It’s 9.5 inches and about 4 inches deep. The one difference with this pan versus the 10-piece set is that it is induction compatible. It also does not include a lid. The square shape is nice in that is has a larger cooking surface than round, and the ability to hold more food when cooking. It would be a nice addition to your kitchen if you want a deeper pan to cook in, but if you get the Gotham 10-piece set, this one may not be necessary, as you’ll already have two other frying pans. 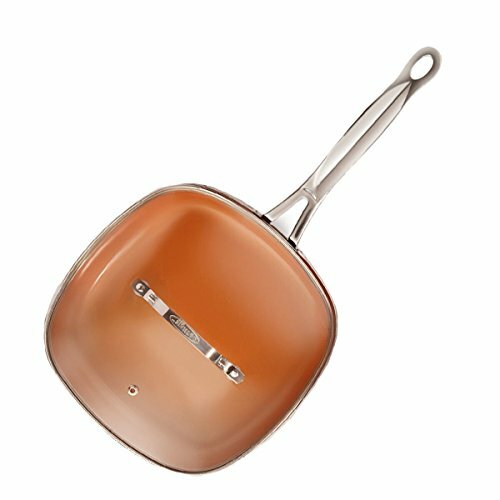 Copper Chef also sells a 9.5-inch square frying pan, which is also part of the 10-piece set. It’s shallower, at less than two inches deep. It is truly square, while the Gotham pan has slightly more rounded corners. Copper Chef claims that you don’t need to cook on as high temperatures as other cooking pans require. It has a stainless steel induction plate built in, which is supposed to distribute high heat quickly and evenly to the entire cooking surface. If you opt for the 10-piece Copper Chef set, you won’t need to purchase this one, as it’s part of the set. These two pans are so close in design and engineering that it is difficult to choose between them. If you have experience with either of the brands, you may have a preference for one over the other. The Copper Chef claims to be oven safe to a much higher temperature and, in my mind, that makes it a little more versatile. It seems to provide peace of mind that it can handle whatever you throw at it. But the reality is, there is so much similarity in these two products that it’s hard to differentiate. When you see them in the store, you have to be careful when choosing as they do look similar. The reality is, despite the claims of non-stick, food will still sometimes stick on these pans. But cleanup seems to be a breeze. As well, despite claims that food can be cut right in the pan, it’s probably wise to take better care of your pans than slicing them with a knife. Common sense tells me that a sharp knife on the surface may eventually wear it out. That’s what cutting boards are for! For me, the 10 piece Copper Chef set is the better option and comparable to similar sets as seen in our Red Copper cookware review. It is compatible with a higher heat in the oven, it is compatible with induction, and the 10-piece set gives you a pot that is truly versatile for everything you need to do in the kitchen. That being said, if you want a range of sizes of pots and pans, the Gotham Steel cookware set may be the better set for you. It may come down to your personal choice of what you want to have in your kitchen for size and range of cookware.